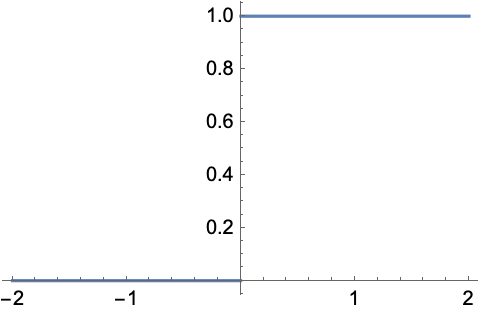 represents the Heaviside theta function , equal to 0 for and 1 for . represents the multidimensional Heaviside theta function, which is 1 only if none of the xi are not positive. HeavisideTheta[x] returns 0 or 1 for all real numeric x other than 0. HeavisideTheta can be used in integrals, integral transforms, and differential equations. For exact numeric quantities, HeavisideTheta internally uses numerical approximations to establish its result. This process can be affected by the setting of the global variable $MaxExtraPrecision.